You've taken the first step on the path to HIPAA compliance. A representative from The HIPAA E-Tool® will be in contact with you very soon to discuss next steps. Meanwhile, take a look at our Frequently Asked Questions page and familiarize yourself with HIPAA E-Tool® features. 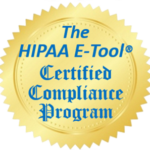 HIPAA Compliance is easy, now that you've found the right partner!